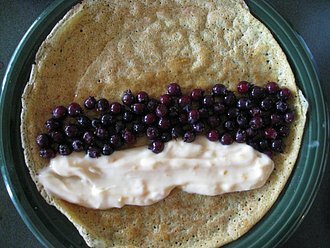 A variety of crêpes are the specialty of the House; one kind is served with our own Saskatoon berries, growing wild around our property. 'European' or 'full' - What should we call it? 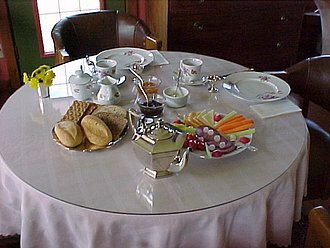 'Nothing special', just delicious; the way breakfast looked like 'in the Old Country' years ago: (something like..) cold cuts, cheese, tomatoes, radishes, carrots, jams and usually an egg (or two as an omelette); coffee, tea or hot chocolate and a juice or a glass of water. Please,let us know well in advance if you have any special wishes.